With the recent end of the NCAA Golf season, top collegiate golfers are terminating their amateur status and entering pro tournaments with the aim of earning enough money to earn status on one of the major tours for 2014. Jordan Spieth was the first to turn pro this season, entering several PGA Tour tournaments early in the year and earning Special Temporary Member status. Just this past week, Alabama’s Justin Thomas and Washington’s Chris Williams turned pro at the Travelers Championship and both made the cut. The main question with these freshly minted pros from my point of view is just how good are they compared to a PGA regular? Luckily, Golf Week/Jeff Sagarin publishes yearly rankings of college golfers measuring their performance throughout the college season. This season, the top ranked golfer was Michael Kim, the low amateur at the US Open. Sagarin reports the ratings on a scale mirroring a typical golf score, with the most elite golfers earning ratings in the 68.0s while the 25th best golfer in a season will rate around a 70.0-70.5. How do those ratings translate into the Z-Score Rating System I use? To find out I constructed a list of golfers that both were ranked in Sagarin’s top 25 for 2010-11 or 2011-12 before turning pro and had at least 8 rounds on the Web.com, European, or PGA Tours in the year after their college season ended (basically June to May). There were 18 such golfers that met both criteria including notables like Harris English, Bud Cauley, and Jordan Spieth. 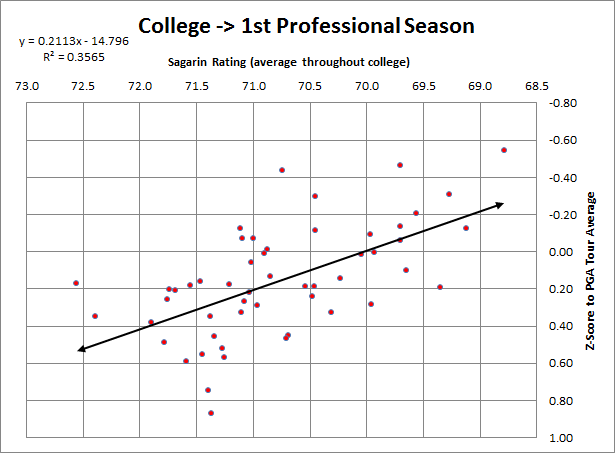 For those 18, I gathered Sagarin ratings for their last two seasons in college (or only one season if they left after freshman year) and their Z-Scores, adjusted for strength of field, for all rounds they played in the year following the end of their last college season. The N for the golfers ranged from 8 rounds to 108 rounds. 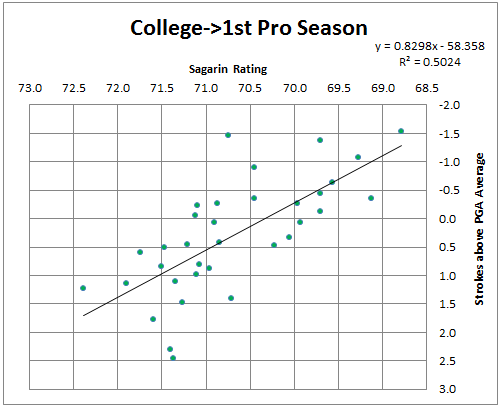 I then ran a linear regression with the average Sagarin rating of the final two seasons in college as the independent variable and their Z-Score in the year following as the dependent variable. 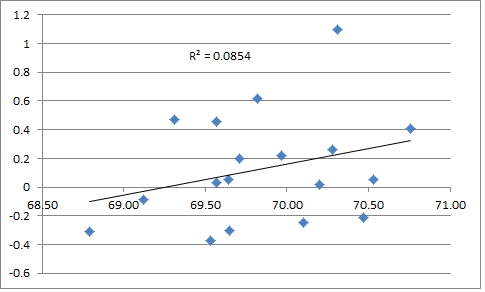 For the full data-set of 18 golfers, the R2 was only 0.09 (graph of data is below) – meaning for our data collegiate performance explained about 30% of performance as a pro. Now, what can we learn from such a small sample? Perhaps not much, especially since there is likely to be survivor bias in the data. The golfers who perform best in their first few tournaments are more likely to get additional sponsor’s exemptions, gain status on a major tour, and get additional rounds of data. 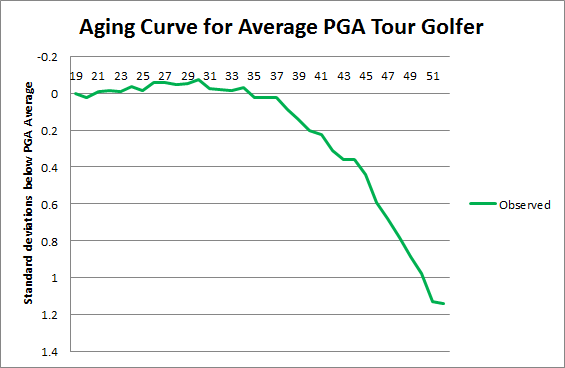 Golfers who struggle early will be forced to play on the NGA Tour or other lower tours that I do not have data for. Perhaps the most important thing is that a golfer would have to play to a rating of 69.3 in college to be projected as a 0.00 as a pro (basically average for the PGA Tour). Only Michael Kim (who is staying an amateur) and Brandon Stone (who just turned pro at this past week’s BMW International and finished T10) were that good in 2012-13. I will return to this subject when I finish compiling Challenge Tour (European minor league) and NGA Tour and eGolf Tour data for past seasons which will give me a much larger sample to work with and from which to draw conclusions.